Aadhar card is a mandatory Identity Card for Indian Citizens. Each individual gets a unique twelve digit identification number and a QR code. Aadhar Card is issued by Unique Identity Authority of India(UIDI). It is now compulsory to link your Mobile no, PAN card and bank Account with Aadhar Card. If you apply fora new Aadhar Card then it gets 90 days to be created. In that duration of three months, you can check the status of Aadhar card by a number of methods. We will be describing the various methods to check aadhar card status below in detail. 1. Check Aadhar Card Status Online. In order to check the status of your Aadhar card, you should have the 14 digits enrollment ID received when you applied for the Aadhar Card. This 14 digit number is marked on the Enrollment slip along with the Enrollment date and time. If you have the above details then visit here. After heading to the above site you will see a webpage like this. Fill the 14 digits Enrollment number in the first column and Date+time(not mandatory) in next column. Fill the random security code in the last column. After filling all the details click on “Check status icon at the end” and you will get the current status of your Aadhar card. 2. Check Aadhar Card status by SMS. of your aadhar Card by sending an SMS. 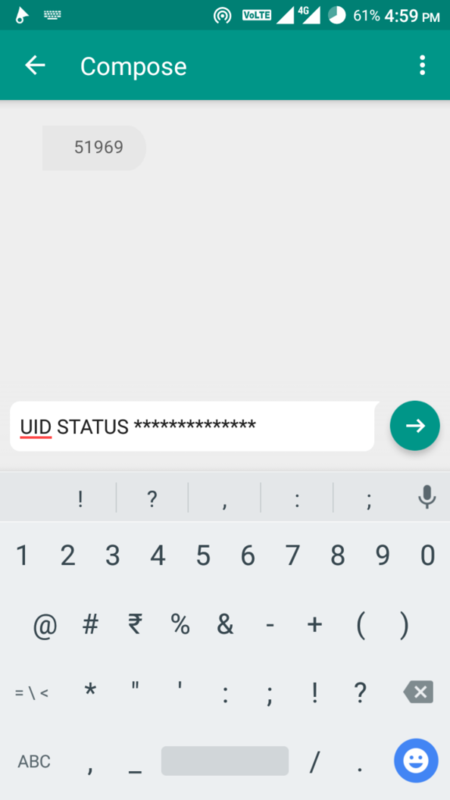 To check Aadhar card status type a Message UID Status (14 digit Enrollment no.) and send it to 51969. In returning message you will receive the status of your aadhar card. If your aadhar card is created then you will get the Aadhar number also. What if you lost Enrollment slip/ number? If you have lost your Aadhar Enrollment slip and don’t have the enrollment number, There is still a way to check Aadhar card status by Name. You must have registered your mobile number or Email-address while creating the aadhar card at the Enrollment Center. you will get the OTP on your registered Mobile no. or E-mail ID. After entering the OTP you will get the Aadhar card no./Enrollment ID on the Registered mobile number. After getting the Enrollment ID you can follow the same procedure as mentioned in the first method.